Isn’t it amazing how Christmas is already upon us? We have less than a month to go before Christmas arrives. And Christmas would not be complete without a live Christmas tree in the home. 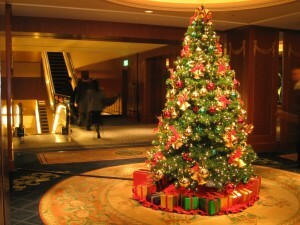 In fact, the National Christmas Tree Association has stated that up to 29 million households use a real tree each year. Choose your tree wisely! Consider wisely where you are going to source your Christmas tree from. A local farm is ideal as this way; you support small businesses and don’t create a significant carbon footprint. Local farms can also be trusted to provide fresh trees that will last longer. Go organic if possible. Check out www.localharvest.org for more information. Feel the needles. You want flexible, not brittle and dry. Handle with care. From the moment the tree is in your possession, you need to take care of it to the best of your abilities. This means wrapping it up in a plastic tarpaulin to keep it protected on the ride home. Pre-cut trees also need to be cut at the bottom. A tree dealer can help you out with the process. Keep the tree hydrated. Studies have shown that watering the tree will help to extend its shelf life. Be sure to get it in water as soon as you can. It is crucial that the base of the tree does not dry out as this will make the needles dry and brittle. Refill its water supply daily. Shield it from harmful elements. Christmas trees need to be protected from direct sun exposure and other sources of heat as these will accelerate the drying process. If possible, use a humidifier so that the needles stay fresh. Lastly, don’t forget to enjoy your tree!